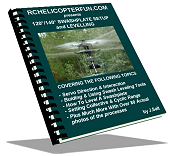 Below are some of the best rc helicopter ebooks out there, written by those who have been there and done it! All are highly recommended and essential reading if you're serious about getting in to the exhilarating hobby of flying a radio control helicopter. RC heli flying is very involved, especially as you start getting in to the collective pitch helicopters. Having an ebook to hand ensures that you will have all the necessary info right there in one place, and you won't need to spend endless hours on the web searching for the help you need. All of the ebooks on this page can be considered essential reading, if relevant to your particular heli, and the help and information contained within them is as good as you'll get. 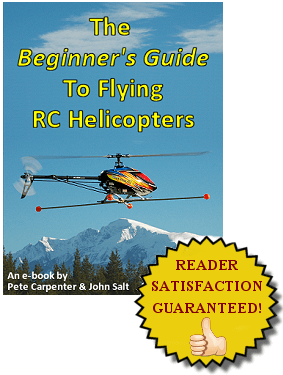 The Beginner's Guide To Flying RC Helicopters compliments my popular airplane ebook, but this one has been co-written between myself and rc heli guru John Salt of www.rchelicopterfun.com. Taking you safely through the stages of learning to fly an rc helicopter, it's an essential read for anyone entering the radio control helicopter sector of RC flying. 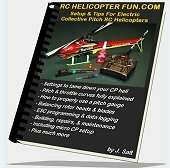 Setup & Tips For Electric Collective Pitch RC Helicopters, by John Salt, is essential for anyone getting in to electric CP (Collective Pitch) rc helicopters. Focusing on, but not limited to, the E-flite Blade 400, this ebook will take you through the setup process for flying your 3D heli confidently as a trainer, as well as covering many other aspects of electric rc helicopter flying, including those inevitable 'heavy landings'! 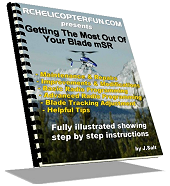 Getting the most out of your Blade mSR covers all the tips and tricks you need to know to take full advantage of this amazing little heli. Essential reading for any mSR owner. The Beginner's Guide To Flying RC Airplanes & Helicopters combo deal.